A new map of global ocean levels recently revealed a relentless rise due to climate change, experts said. The latest measurements of global ocean heights were taken by Jason-3, a new satellite operated by U.S. and European space agencies. Its first complete map of sea levels was released by NASA in mid-March, and adds to 24 years of previous measurements. “This is a continuation of probably one of the most iconic time series demonstrations of sea level rise and global warming,” said Bill Patzert, a climatologist with NASA. To Patzert, these measurements are proof of manmade climate change. “As we add more and more greenhouse gases to the atmosphere, it increases the heating of the Earth, and of course 95% of all that heat is being absorbed into the oceans,” Patzert said. Sea level rise is really the unequivocal proof of global warming. “As oceans heat, they expand, so sea level rise is really the unequivocal proof of global warming,” Patzert added. Jason-3 was launched on Jan. 17 from California's Vandenberg Air Force Base and is a collaborative mission between NOAA, NASA, the French Space Agency CNES, and the European Organisation for the Exploitation of Meteorological Satellites (EUMETSAT). The mission continues nearly a quarter-century of global sea level measurements taken from space using satellites. 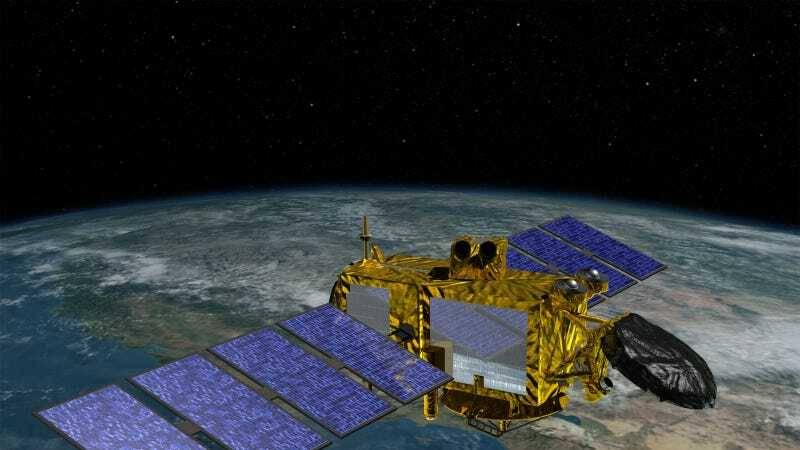 The first mission began in 1992 with TOPEX/Poseidon, and was followed by Jason-1 in 2001 and Jason-2 in 2008. Thanks to the decades-long record, researchers can now differentiate the short-term variation due to events like El Niño or Pacific Decadal Oscillation—which can cause sea levels to rise in the eastern Pacific and drop in the western, or visa versa, for 10-15 years at a time—from the slow yet consistent rise due to manmade climate change. "There are these large changes due to El Niño or decadal variation in ocean climate, but what is relentless is the global rise in average sea level across the entire planet. One is man-made and one is natural," Patzert said. "The slow rise in sea level of about one inch per decade, that's due to us," Patzert said. Other experts agreed that a continual rise in ocean heights was apparent in the data. "The combination of old and new satellites provides a continuous global map of sea level that goes back several decades now," Michael Mann, director of the Earth System Science Center at the Pennsylvania State University, said. That provides the scientific community with "an important source of information regarding global sea level rise," Mann added. Jason-3, the fourth mission in the series, flies over 800 miles high in space and uses altimetry to measure sea levels to "within a centimeter," Patzert said. "A radar bounces microwaves off the sea surface and measures the time it takes to travel back to the spacecraft," Patzert said. Lessons learned over the years have led to more precise instruments, for example to get measurements closer to the coastlines, according to Claudia Ritsert-Clark, a spokeswoman for EUMETSAT. This helps scientists calculate a more accurate mean global sea level rise, "which is of the order of 3 mm (0.1 inch) per year," she added. In 1900, it was mostly warming, now it's melting—two-thirds of it is new water from ice sheets and glaciers. What's more, data that Patzert has been working on with glaciologists and ice-sheet scientists show that most of the sea level rise today is due to melting, rather than just expansion from global warming-heated oceans. "In 1900, it was mostly warming, now it's melting—two-thirds of it is new water from ice sheets and glaciers," Patzert said. Ice-sheets in Greenland and West Antarctica have become increasingly unstable, and glaciers in Alaska and other areas have been disappearing at alarming rates. "We're living in a warming world, we're living in a melting world," Patzert said. Some 13 million Americans living along the coast are at risk of floods due to rising seas because of climate change, according to a study published earlier this month in British journal Nature Climate Change. Parts of the East Coast that never experienced flooding before are now being subjected to regular "nuisance" floods, Patzert said. Communities already prone to large hurricanes and storm surges are more vulnerable today than they were 50 years ago, he added. In more bad news for coastal areas, the unusual strength of this year's El Niño could inadvertently contribute to a busy Atlantic Ocean hurricane season, Weather Underground meteorologist Bob Henson said. El Niño’s effect on ocean levels was also measured by Jason-3, which revealed an area of higher-than-normal seas off the coast of South America in the tropical Pacific—the fingerprint of the event. That region appeared even larger than the last strong El Niño in 1997-1998 to which this year's is often compared, Henson said. In the map, the first of many Jason-3 will create during its three-year mission, higher-than-normal sea levels are depicted as red and lower are blue. El Niño is visible as a large, oblong red region of unusually high seas along the equator off the coast of Peru and Ecuador. Recent Jason-3 satellite image showing the El Niño signal. While the current El Niño was bigger than the other, it's hard to call any one event "the strongest" due to a host of other ocean and atmospheric conditions that can vary, Henson said. "One thing we do know is that it's weakening, which is consistent with other big El Niño events this time of year," Henson said. Generally, strong El Niño events are followed by La Niña conditions. The 1997-1998 El Niño was followed by three solid years of La Niña—characterized by cooler-than-usual water temperatures and increased likelihood of Atlantic hurricanes, Henson said. That's because La Niña often accentuates temperature contrasts, raising the odds of extreme weather, Henson added. It all depends on how fast El Niño-heated waters cool down. So far in 2015 and 2016, El Niño has contributed to warmer weather in the northern U.S. and more precipitation and flooding along the Gulf Coast, Henson said. The last few months of El Niño were supposed to deliver cooler weather and rain to the Southwest and southern California, but that hasn't really happened yet. "We still have a few weeks left for moisture in the southwest but personally, I'm skeptical we're going to see a huge amount," Henson said. Average temperatures worldwide have risen 1 degree Celsius (1 C) since humans began burning fossil fuels. That's halfway to the limit of 2 degrees Celsius warming that world leaders agreed to last December at COP21 in Paris, France, to prevent the worst effects of climate change. As climate negotiators prepared for the UN conference last year, each month in 2015 seemed to break heat records. In January, it was official—with NASA and NOAA scientists reporting that 2015 was the hottest in historical record. Climate change "is a very dangerous experiment that is underway," said Patzert.